Steve Ritz of the Green Bronx Machine Project, NYC, NY. Watch this video and you will pick up the vibe…Steve Ritz talks about his Green-Bronx-Machine…his efforts to green up the Bronx: feeding kids great healthy green food, training a work-force to build vertical green walls and green roofs. His efforts are awesome and everyone should know about him. Take a few and see him here…. It is SO worth it. Steve’s enthusiasm is contagious. It makes everyone feel more empowered and capable. You start looking around yourself to see ‘what can I do’ to make it a better place. To make children shine, to make the world more sustainable. 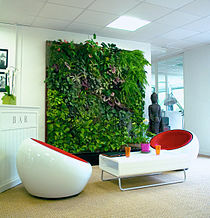 I really want to see his green growing vertical walls — everywhere! For more info on the TC TEDx events and plans for next year – http://tedxtraversecity.com/ See you there! This entry was posted in Green Growing Things, Lectures and tagged Technology. Bookmark the permalink.